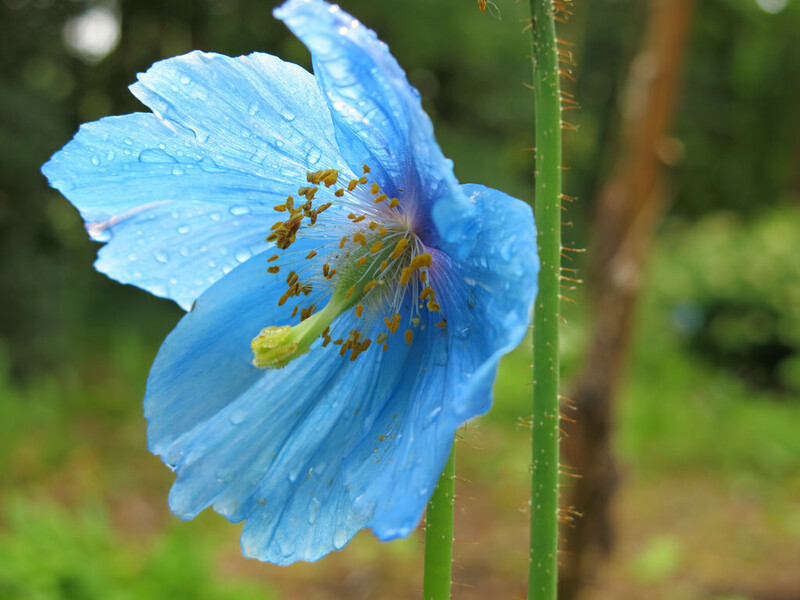 Seeing a blue poppy has been on my life list and yesterday I finally saw one when I took dear daughter and her friend to the Weyerhaeuser Rhododendron Gardens in Federal Way. We actually went to see the Rhododendrons and while there were many still in bloom I feel like we missed the peak viewing by a couple of weeks. We were having a grandtime walking the trails and were admiring a small pond when a pleasant woman asked if we had seen the blue poppies. Ummm, no, guess we missed that section of trail. Thank you lady! The poppies are taller than I expected and there was some space between the stalks. They were just a little translucent and there was a bit of rain on some of the petals. The photos below feature the blue poppies, but include some other flowers and some Hilltop Artist glass work that is currently on display. This entry was posted in Art -- there is art here!, Farms and Gardens, Federal Way, WA State - King County and tagged blue, Federal Way, flowers, Poppies, Poppy, Rhododendron, Weyerhaeuser on May 24, 2014 by admin.